Like many small business owners, keywords and search rankings may be the first concepts that come to mind when you hear about digital marketing. At its core, however, online marketing serves the same purpose as its traditional counterpart: to persuade people that a service or product fulfills specific needs or wants. Search engine marketing is only another means to this end. Whether you're handling your own digital marketing or have an agency, the focus should be on your customers--on people. Audience targeting is one strategy to ensure marketing speaks to customers' needs at each stage of the consumer search cycle on their way to making a purchase. Think about the last time you stayed home sick and watched weekday television. You probably noticed there were a lot of commercials for vocational schools. Chances are if you're home at this time, you're not working, making you the target market. However, people are unemployed for different reasons: you could be a high school student searching for your path or a middle-aged adult seeking a career change--two groups with different motivations for enrolling in a vocational school. How could the school convince both demographics that its program is right for them? Market to them separately. Say you're in charge of digital marketing for the school. Your first step would be to use data about the target market to divide it into groups based on shared characteristics, a process called market segmentation. Next, you would use additional research to build composite characters, known as personas, to represent the wants, needs, and other attributes of each group. Using these personas, you could then target each audience with customized marketing messages at every step of their online journey as they progress toward enrolling at the school. This process is called the consumer search cycle. I'll give a more detailed overview of the audience targeting process later on in the article. You may be wondering if you have the time for audience targeting. Consider it an investment. Blindly marketing to your customers could not only prove ineffective but also detrimental. On a daily basis, we're all constantly connected to a multitude of online channels through various devices like smartphones, tablets, and desktops. Pop-ups. Sign-ups. Display ads. They get old fast--but not if they're for something we need or want, or didn't even know we wanted. Customers appreciate a personalized online experience and will choose brands that provide it to them. Fortunately for some, businesses are increasingly tailoring their marketing toward specific customer bases. The vast amount of available user data has allowed for greater personalization and even for products like digital personal assistants. Staying competitive means customizing your marketing to your customers. As a small business owner, you likely already have access to valuable customer data. Use this audience targeting overview below to get started. 1st Party Data: You can glean information about who your customers are, when they shop, and what they buy, as well as which marketing campaigns were most effective with them, from your Google Analytics account, customer database, and email marketing campaigns. If you have the right measurement systems set up, this data can be easy to access and it's free! 2nd Party Data: Want to expand your data pool? Partner up with another business to use their 1st party data. For example, if you sell running shoes, you could try to acquire user data from an enthusiasts' website. Instead of paying for the information, you may give the site a small percentage of sales. One caveat here--don't share data with competitors. 3rd Party Data: Large companies specialize in aggregating data from public sources like censuses and private ones like publishers. While you'll find user information for almost any market, it's not free, and anyone, including competitors, can purchase it. Next, develop your segments into customer profiles, or personas, asking questions based on the data. What's important to young women, and probably some men too, who are embarking on a career for the first time in their lives? Career longevity? Upward socioeconomic mobility? This may be important to those switching professions, but they may also be concerned with balancing career and family obligations. Identify the needs, wants, and problems of each persona so that you can present solutions to them in your marketing messages. Your final and most actionable step in the audience targeting process is to map your personas' journeys through the consumer search cycle--the series of steps we all take before we purchase a service or product. 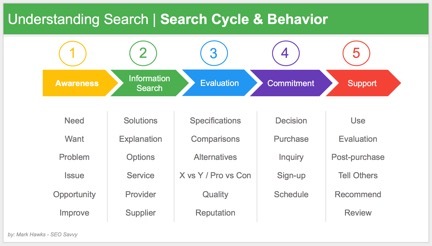 I like to use a 5-stage process to map the consumer search cycle before they purchase. You'll want to identify their needs at each stage, and create content that aligns with each stage. 1. Awareness: This is the stage when the customer is aware they have a need and are searching for answers. Both groups in the above example of a vocational school target market know they want a career. High school students might search for phrases like, "What career is right for me?" Your older audience could type in something like, "Looking for a new career." Use these phrases to optimize educational content like blog posts, ad copy, and landing pages on these subjects, highlighting cosmetology as an option. 2. Information Search: In this stage the customer is looking for solutions. They'll be searching for information about cosmetology school next, so create articles and videos that highlight the advantages of this career path, such as career longevity for students and flexibility for adults. Producing brochures, ebooks, and whitepapers that answer customers' questions is powerful in this stage. 3. Evaluation: Now they'll be comparing schools. Since "cosmetology school" is a highly competitive phrase, use keyword variations that differentiate the brand by adding geo-modifiers, reviews, comparisons, and quality. Produce webpages that communicate the strengths that your school provides, especially solutions that others may not: perhaps cost, scheduling options, class environment, or childcare services. 4. Commitment: They're ready to commit to your school, so provide an easy path to schedule a visit or an easy online enrollment process. 5. Support: Ensure your students are so satisfied with the school that they'll write positive reviews and refer friends. You can do this by keeping them informed about services and assistance available, as well as student events, and encouraging them to share their experiences. Stay in touch with graduates with an email newsletter. While SEO helps customers find websites through online search, audience targeting allows brands to create content and online experiences tailored for their customers. After all, services and products serve the needs and wants of customers--why shouldn't marketing be tailored as well? How well do you know your audience? Please share any tips, tools or insights.